I’ve worked in retail almost 25 years and personally investigated customer accidents involving infants, children and shopping carts. As a new parent, shopping with your infant is another way to share your bundle of joy with the world (while crossing things off your to-do list!). Historically, there are two ways to shop with a baby in tow: place the baby carrier in the shopping cart – leaving little space for the goods you came for – or place the carrier unsecured on top of the cart. The second options is risky resulting in tens of thousands of visits to the emergency room each year and of course the unreported injuries. 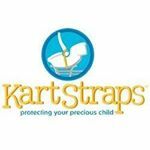 KartStraps allow parents to easily transition their infant carrier from the car to the shopping cart, ensuring a safer shopping experience for your child and a more relaxing one for you. Designed for seamless coupling with any infant carrier and shopping cart, simply place the carrier on the cart and secure it with the heavy-duty straps. There is also no need to remove the straps when not in use. Simply connect each strap to the upright handle for out of the way storage. Leaving the straps on will not interfere with the car seat locking into the base. Now you can shop with your infant safely secured. It does not make a shopping cart top heavy. It’s the same concept as the car seat docking station you may have seen on carts in the largest retailer in the world. Unfortunately those docking stations are expensive and you rarely see them in retailers, definitely not grocery stores, because of the liability risk placed on the business. As my son just turned 4 in November, I will not rest until there is no infant injuries involving shopping carts. Looking for partnerships with anyone who is as passionate about child safety as I am.